The 40.05 metre motor yacht Thumper has had a central agency change and is now listed for sale with Alex Lees-Buckley at Camper & Nicholsons International. Built in GRP by UK yard Sunseeker International to RINA class, Thumper was delivered in 2014 and was nominated for a 2015 World Superyacht Award. She has a highly detailed, bespoke luxury interior design, using clean, bright decorative materials of leathers, pale timbers, metals and semi-precious stones. Inspired by a ‘Miami & Ibiza Beach Club’ theme, the interiors feature white washed timber floors and ceilings with pale vein stones, making the already expansive 40 metre yacht feel even more capacious and beamy. This yacht for sale features an extremely spacious lower saloon, plus a modified upper sky lounge. All finishes are unique, designed with the assistance of an interior design company to create a refreshing interior. The main aft deck is particularly suited for al fresco entertaining and dining, and includes a 32 inch Aqualite exterior television. Twin 3,180hp MTU engines comfortably power her to 23 knots. 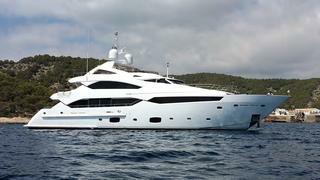 Lying in Monaco, Thumper is asking €12,970,000.